Receive efficient, quiet and space-saving heating and air conditioning with an ingenious mini split system — also known as a ductless system. Transform your home, garage or workshop with the latest breakthrough in heating and air conditioning. We can install ductless systems nearly anywhere to provide quiet, efficient heating and cooling to any space through modern heat pump technology. Choosing a mini split system means you receive a unit with a smaller footprint than standard central air and furnaces. You don’t need to have the usual air ducts, just a space on the wall and a spot outdoors for a small heat pump. The wall unit delivers quiet, efficient heating and cooling to your rooms. A ductless system serves as an excellent alternative to traditional heating and cooling. If you own an older home or want to cool or heat a space without existing ducts, you will want to check it out. The air handling unit takes up very little space on an interior wall, and the condenser unit is smaller than a central AC condenser. These facts make it possible to cool areas where you didn’t think heating or air conditioning was attainable. Please ask us if a ductless AC unit is right for you! Get lasting comfort when you choose Doug’s for your mini split, ductless air conditioning system. 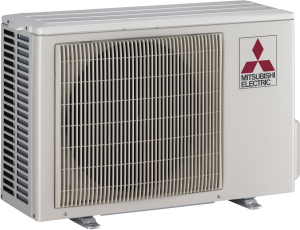 We offer licensed, trained installers who are backed by Mitsubishi, who has named Doug’s Heating & Air Conditioning as a Preferred Diamond Contractor. This designation ensures you receive the best in sales, installation and service—plus, every purchase is backed by a 7-year parts and compressor warranty.